SUPPORT TEAMS outside the Tham Luang cave in Chiang Rai were yesterday waiting eagerly for a signal from the team searching for 12 teen footballers and their assistant coach who have been trapped inside the flooded cave since June 23. 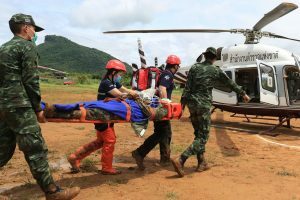 Narongsak Osoththanakorn, governor of the northern province, said that the search team was highly hopeful yesterday after all the positive developments in the large-scale rescue operation. 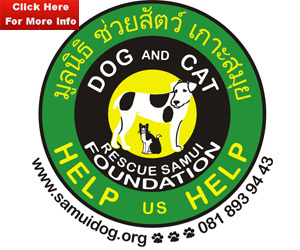 The positive developments yesterday included success in being able to pump a large amount of water out of the cave, enabling the team of Navy SEAL (Sea, Air and Land Teams) divers to move closer to the so-called “Pattaya Beach” section where the missing are believed to be waiting for rescue, the governor said. “Tonight [last night] everybody will be working all the time,” Narongsak Osoththanakorn, who is in charge of the rescue operation, said in his press conference. He said other units were in full readiness to bring the missing footballers out of the cave. They are just waiting for a signal from the search team. The SEAL divers had nearly reached a T-junction in the depths of the cave just two or three kilometres from where the boys are believed to be, the governor said. Water levels inside the complex labyrinth of tunnels finally dropped thanks to dozens of pumps set up to drain the pools, even as heavy rain continued to pound the area near the Myanmar and Laos borders. “The situation is better today than yesterday and the day before. The water level has receded considerably and we are pumping out water in all the chambers,” he told reporters. Medical teams staged drills yesterday morning to prepare for possible rescue, amid worries about how the boys might be pulled out of the cave if and when they are found. Ambulances and helicopters were on standby for the drills at the bustling rescue site. 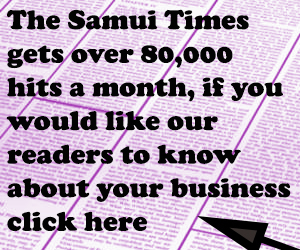 The Chiang Rai governor said the evacuation drill found several obstacles that needed to be tackled when the actual evacuation takes place. He said one issue was the lack of cooperation of people who would not move their vehicles for the road to be cleared. He said the order of ambulances and the evacuation of the rescued persons in various steps also needed to be improved. Video footage of all the steps were taken to work on how the process could be improved. He said if the operation saw any further progress, the governor would hold another press conference. He also urged onlookers to refrain from Facebook Live coverage of the scene, as they could obstruct the work of the authorities. The governor added that there are now more than 10 diving robots and diving drones at the site but they could not be operated because the cave is dark and the water too murky for the controllers to see anything. The governor also called on officials from various teams to refrain from talking to the media about the operations of other teams. He said if any official has any recommendation, he or she should talk to other teams directly or else the comments could be seen as criticism of other teams. In the afternoon, the water level in the cave subsided a lot and 16 Navy SEAL divers surveyed Chamber 3. At 1pm, the divers were in the process of extending a rope and a phone line to the three-way intersection that straddles Pattaya Beach and the right passage of the cave. The Navy’s SEALs plan to set up a forward command at the cave’s T-junction before sending divers to Pattaya Beach. Divers from the Navy SEALs reached the third chamber from Tham Luang cave’s entrance before noon yesterday after rains stopped and water was drained from the cave up to a level. The Thai Navy SEAL Facebook page reported the progress of the operation, in which divers and Army troops helped move water pumps into the cave to drain water in the morning. The water drained very quickly, the page reported. When the water was drained up to a level, the SEAL divers managed to enter the third chamber. They carried oxygen tanks with them to set up the forward command. Rains over the cave have stopped since 4am and officials stepped up efforts to drain water from the cave’s entrance. Five helicopters airlifted a team of Border Patrol policemen yesterday morning to resume search of a shaft over the cave. 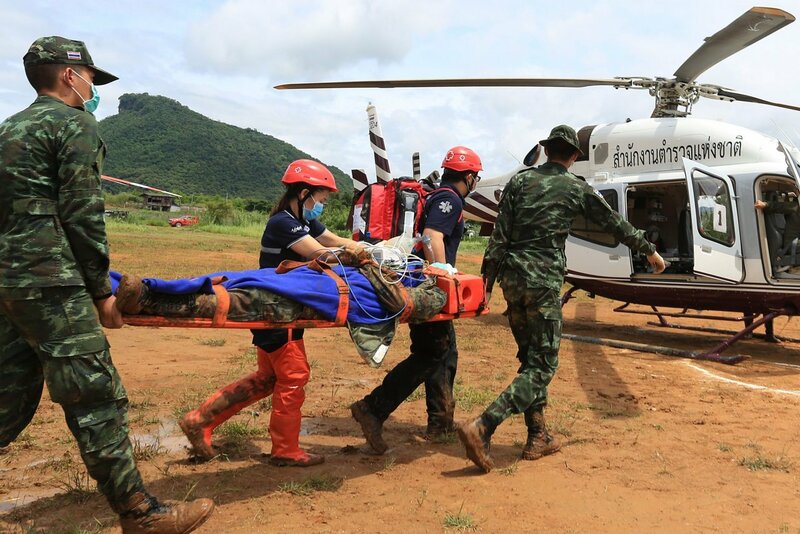 The team planned to climb down the 60-metre deep shaft from Pha Mee Mountain to try to reach three chambers on the side of the cave where the missing youngsters may have been trapped, deputy police commissioner-general Pol General Veerachai Songmetta said. On Friday, the police had reached the bottom of the shaft but had not entered an opening believed to be connected to the chambers, said Veerachai, who heads the team. The Border Patrol policemen are now equipped with wireless communication tools that would feed their pictures back live to the top of the mountain, where Veerachai was based, for analysis. Meanwhile, a senior rescue official complained about the wastage of time caused by the lack of adequate coordination between several teams exploring shafts over the Tham Lung cave. 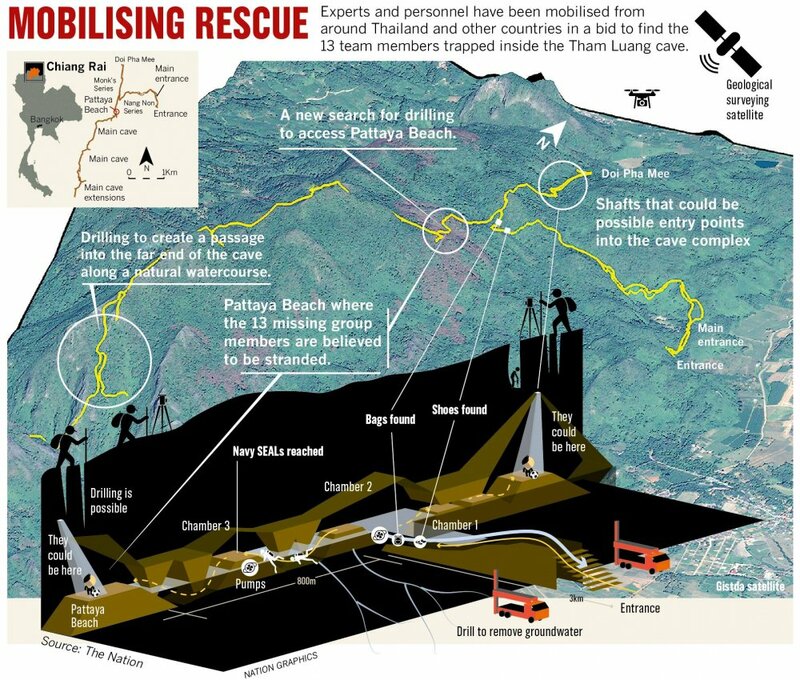 Lerpong Suansang, head of a search team of the Disaster Prevention and Mitigation Department, said there were several teams searching for shafts that could offer a passage to chambers in the cave where it is believed a 13-member football team could have been trapped. He said several shafts had been searched and that they only led to a dead-end. Due to lack of coordination, other teams also ended up searching the same shafts, assuming them to be new discoveries.